We’ve only been using Cuddles A Plenty since the beginning of January but it’s been amazing! Trevor our Italian greyhound has so much fun when he goes and is worth every penny with him being socialised with other dogs. The owners are really friendly and you can tell they genuinely care about each dog that visits! Excellent service. It’s so good to see buffy socialising with other dogs. She was timid on her first session, but already she’s much more confident and seems to really enjoy it!!! I can go to work knowing she’s well looked after and having fun!!! We’ve used Cuddles A Plenty for just over a year now. And, this weekend, I realised a clear example that demonstrates how valuable an investment it can be for your dog. After discussing training methods with Dionne on Thursday, we decided to give ‘Clicker Training’ another go at home. She sells them in their shop. So I picked one up, and clicked it. My dog sat down immediately and locked her eyes on me. You see – the centre has clearly been Clicker Training our dog for the past year. To such an extent, that in one weekend we’ve managed to make major strides in adjusting some unwanted behaviour (barking at the TV.. rushing the front door..). All because of the positive association they’ve created and enforced with clickers over the past year. In summary, the service offered on the surface at Cuddles is you can go about your day and not have to worry about your dog’s wellbeing. However, underneath that, letting your dog go to Cuddles gives them an opportunity to thrive and develop into the well-balanced dog we all want in our lives. It’s no surprise they have the number of positive reviews that they do! All dogs are kept in small groups, to ensure we can give the best care and attention at all times. Cuddles-A-Plenty is not just a safe, fun place to leave your dog when you cannot be there yourself…..we offer so much more than that…. Yes, we have the perfect place for your beloved dogs to spend their days while you are busy. They will make lots of new friends, spending time having fun with the staff and other dogs but their individual needs will be catered for and each & every one of them will be treated as though they are our own. 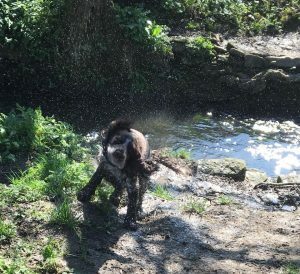 We wouldn’t want our dogs to simply be let loose to run wild with any number of other dogs, with maybe the odd ball thrown for them here and there – so we would never find that to be an acceptable level of care for your dogs either. This is why all dogs are kept in small groups with lots of 1:1 interaction and individual attention. We wouldn’t want our dogs to be given their dinner or treats within reach of any other dog. We would prefer them to be able to take their time with their food and not worry about it being snatched away from them. This is why we have a dedicated feeding area where dogs receive all food items on a totally individual basis – no matter how small the treat or how quickly it can be eaten, you would never have to worry about food squabbles in our care. We wouldn’t want to confuse our dogs when it comes to toileting by sending them somewhere that does not have access to an outside area. This is why we spent over a year waiting for the right property to come our way with a large outdoor space for fun, games (including water games in Summer!!) and those all important toilet breaks. We wouldn’t want to be worrying about how cold our dogs were in the Winter months – and lets face it – we have long Winters!. This is why we insisted upon having state of the art infa-red heating systems installed to ensure your dogs are kept toasty warm, no matter what the weather outside. We wouldn’t want our new puppy to be put straight in with older/bigger dogs and risk a negative experience. This is why we have a dedicated puppy area with teething toys, a sensory board and lots of enrichment activities with regular outdoor toilet breaks to assist with training. We would want our dogs to be treated with the love, care, respect and total devotion that they get from us at home – and that’s exactly what all dogs who come to Cuddles-A-Plenty receive. You are more than welcome to come along and view the daycare centre at any time during our opening hours. However, please ensure you make an appointment before bringing your dog with you. This is to make sure there will be an appropriate member of staff available to run the initial assessment. Following a successful assessment, you are then welcome to book your dog into the daycare centre as often as you like. All dogs must be presented with an up to date vaccination certificate on their first visit and again on renewal of the vaccinations. All dogs must be regularly treated for fleas & worms. All fully grown male dogs must be neutered before being able to attend the centre. No female dogs can attend the daycare centre whilst in season or due to be in season. No multiple dog household discounts available on the hourly rate. Book and pay for 5 full days in advance and receive 10% off. No discounts are available for booking blocks of half days or hourly visits in advance. There may be a reason you feel day care might not be best suited to your dog and would prefer one of our exciting walks instead. Or perhaps you love the idea of Doggy Day Care but would prefer a shorter session for your dog without having to leave work early to collect him/her before the end of the day. Our day care/walks could solve these problems for you. Option one would be for us to collect your dog from your house and transport him/her, safely crated, in our fully insured vehicles to the day care centre. Your dog would then spend between 3 & 5 hours with us, socialising and playing with some of the other dogs before being safely transported back again. You can return home from work happy in the knowledge that your dog has had a fun packed, joyful day without you having to lift a finger! Option two would be for your dog to join us on one of our exciting walks which last between 60 & 90 minutes. We visit different places during these walks, so not the same old field every day and the maximum number of dogs walked at any one time is four. This means more individual time can be spent with each dog so if you have problems with your dog such as pulling on the lead or not coming back to you when called, these can be worked on during our time together. Your dog would be out of the house for up to 3 hours in total (including travelling time and collecting other dogs booked onto the same walk) and must get along with other dogs. Each walk is tailored to the individual and one dog is only walked with others if their needs are similar. You will receive regular updates of things your dog enjoys and if we come across anything he doesn’t particularly like, along with tips on how to overcome any problem behaviours. You can be sure you are entrusting your dogs to someone who is always willing to go that extra mile in providing the best service possible. DBS checked, proud members of PIF (Pet Industry Federation) and committed to providing a force free, stimulating, happy time for your dogs – exactly what your dog deserves! Our exciting walks last between 60 & 90 minutes and your dog could be out of the house for up to three hours in total for just £25 per dog. Bringing a new puppy home is very exciting but it is extremely important not to leave them alone for too long during those impressionable first few weeks & months. 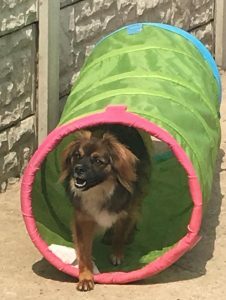 Once they are fully vaccinated, coming along to our day care centre, where we have a separate area for puppies, is perfect for them to learn how to socialise with other dogs and receive lots of play time, stimulation and cuddles! Until that time, we offer temporary 30 minute puppy visits at your own home, providing you live within 5 miles of the day care centre (NG6 8AW). During the home visits, we will follow any instructions you provide but they usually involve a toilet break in the garden, free play in the house/garden, feeding, and short walks around the garden on the lead to help get puppy used to that foreign object they all hate so much to begin with!! 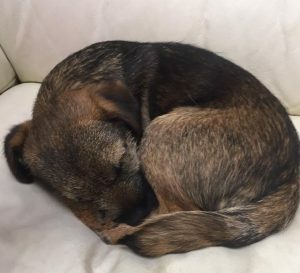 The home visits are a temporary measure and available until your puppy is fully vaccinated and able to socialise with other dogs so can attend the day care centre or join in with our exciting 60 minute dog walks. DBS checked, proud members of PIF (Pet Industry Federation) and committed to providing a force free, stimulating, happy time for your pups – exactly what they deserve! Our puppy home visits are available Monday to Friday between the hours of 9am & 4pm for postcodes within 5 miles of NG6 8AW. Each visit lasts a total of 30 minutes and costs £15. 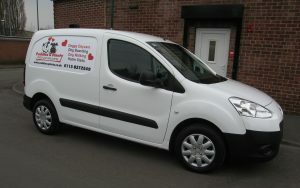 We are fully insured to collect and return your dog for you at a rate of £5 per journey. This applies to households within 5 miles of the day care centre (NG6 8AW). We may still be able to help if you live outside of this area – Please contact us for a price. A 2 hour time slot would be required for collection or drop off. We could not guarantee an exact time. This service operates between the hours of 7:30 am to 6:30 pm.